I’ve known Payton since he was just a cute little tow-headed toddler. 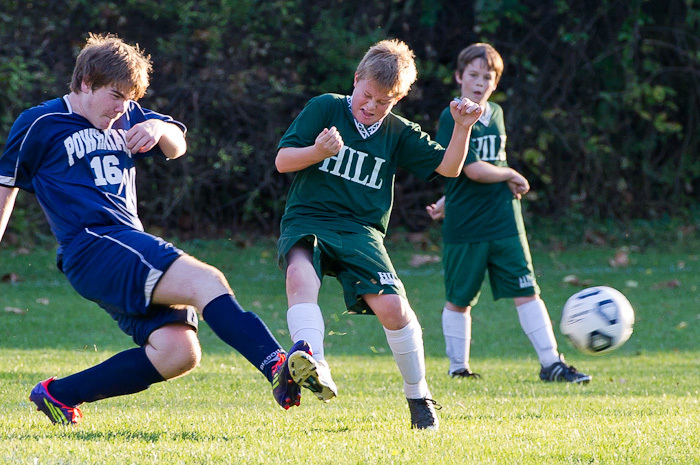 He’s always been smart and athletic, but I hadn’t realized the extent of his toughness and determination until I watched him play soccer on the Hill School varsity team this season. As one of the six sixth-graders to make the squad, Payton has certainly held his own, mostly playing defense. Even though the opposing players coming at him are often nearly twice his size, Payton digs in and won’t let them by without a serious fight. And when he wrestles the ball away, his seemingly effortless kicks back to the Hill offensive players often set them up perfectly for a run at the goal. Several appreciative parents have (out of curiosity, I imagine) asked me why I photograph all the kids playing on the JV and Varsity teams when I could just be taking photos of my son. I suppose it’s because I’ve watched many of these boys grow up, in some cases from tiny infants, and I just marvel at the changes before me. Capturing them through the lens on the soccer field seems to stop their momentum for just a moment, allowing me to see how far they’ve come and the special person they’re growing up to become. That is a curious question the parents posed to you…the way I look at it is ( and you do too) why not photograph the other kids…they are part of your sons life and your too. I guess some folks just think differently. Oh well. I like this post. I think a few of them really only focus on their own children. One has a nice camera and also sometimes takes photos, but I think she only takes them of her own son. As you said, just a different perspective. I love taking photos of all of the children. It’s just as rewarding to me to get a great shot of someone else’s son! Taking all of these photos is also great practice! Oh yes, I do put them on my website for all of the parents to see. I get lots of nice emails, so it’s very rewarding. And it keeps me from yelling too loudly at the games since I’m focused on shooting!